Ordered by mistake but find really useful. Good for mopping up . A handy resource for care and residential homes, this Airlaid Large Wash Cloth 100 Pack has been designed to support care workers. 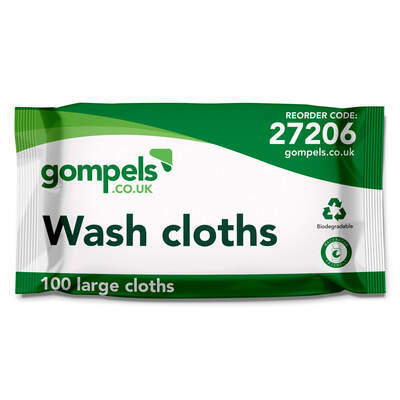 Suitable for both frequent washing and drying, each cloth has a large surface area allowing for a speedy cleansing experience. The air-laid construction is highly absorbent while maintaining a strength while wet. The soft texture is suitable for even the most sensitive of skin and each large wash cloth will lather up well with both soap and water. If you want to make the very best Water Wipes then you cannot get any more pure than soaking these wipes in fresh water tap or bottled water. With no extracts of grape seeds or other additives, you will be creating a much fresher alternative to water wipes. Our Resident Cleansing category has everything you'll need to provide the highest levels of care. From our E45 Cream through to Cussons Mild Cream Soap and even Shower Chairs, you'll find the perfect item here at exceptional wholesale prices.